President Donald Trump's proposed new branch of the military, Space Force, is being brought to the small screen courtesy of the folks at Netflix. The streaming service has tapped Steve Carell to star in the series, who will serve as co-creator alongside Greg Daniels, marking a reunion for the two who previously worked with one another on the hit sitcom The Office. Netflix has already given a straight-to-series order for the new show and they've even released a teaser trailer to help set the tone. 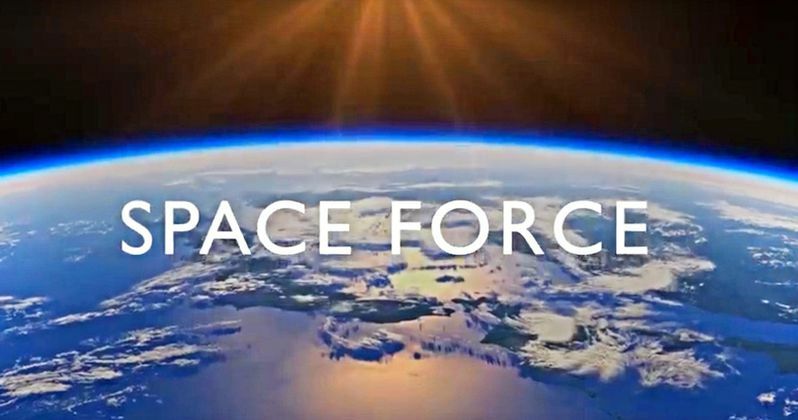 The series is being described as a workplace comedy that will center around the people tasked with creating the proposed sixth branch of the military, Space Force. President Trump initially ordered the creation of this new military branch in June 2018, which helped to spark the idea for the show. The teaser features an epic shot panning over the Earth from space with some choice words that help set the tone for what's coming our way. "On June 18, 2018, the federal government announced the creation of a 6th major division of the United States Armed Forces. The goal of the new branch is 'to defend satellites from attack' and 'perform other space-related tasks.' Or something. This is the story of the men and women who have to figure it out." The project is in the relatively early stages, despite the fact that Netflix has already released this brief teaser. An episode count has yet to be determined and the scripts for the series haven't been written yet. One thing that is clear is that Steve Carell is going to get a massive payday for his involvement in Space Force. Steve Carell hasn't done episodic television since leaving The Office during season 7. Instead, he's been doing more producing and serious acting, having starred in movies such as Foxcatcher, The Big Short and, more recently, a trio of dramas in 2018 with Beautiful Boy, Vice and Welcome to Marwen. For his new long-term TV commitment, Carell will reportedly be paid more than $1 million per episode, which will likely top what is earned by the core cast of The Big Bang Theory. But Netflix has proved time and time again that they're happy to shell out big money for premium content. And considering that The Office is still one of the most-streamed shows in their library, this move makes sense. Greg Daniels, who also serves as showrunner, will executive produce the series alongside Steve Carell and Howard Klein, who also worked on The Office as well as Parks and Recreation. There is no word currently on when we may see Space Force debut, but since the show hasn't even been written yet, mid-to-late 2020 seems like a realistic expectation. We'll be sure to keep you posted as further details on the project are made available. Be sure to check out the first trailer for Space Force from the Netflix YouTube channel below.